We are so pleased to announce the winner of our first contest! 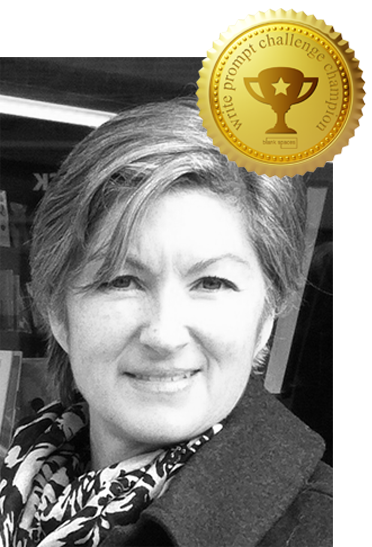 Congratulations to Geraldine Mac Donald from Kingston, Ontario on her winning story, 'The Clubhouse Blues'. 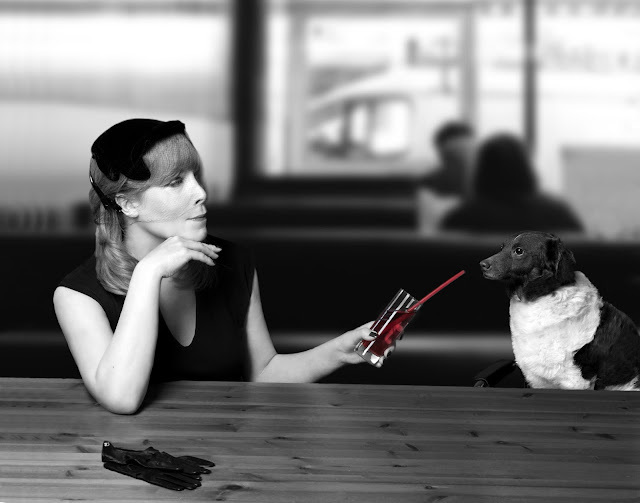 Using the provided image of a woman and a dog sitting at a counter, Geraldine constructed an engaging 'Film Noir' styled tale that impressed our judges. As a reward, The Clubhouse Blues was published in our December issue. When we contacted Geraldine with the good news, she responded by saying, "Wow! You must know how incredibly pleased this makes me. Thank you for such a fun photo prompt challenge. It's the first time I've ever done anything like this, so winning is such a thrill. Amazing. Please thank your judges for their comments. I was totally going for that gansta' noir vibe so I am happy they felt it in the story." "Great use of language to take the reader into the era depicted in the photo prompt." "...a classic 'Film Noir' approach. I loved the old school gangster vibe...The voice and tone used were right on point." I was down at P.J.’s the night that Frankie opened. He’s got some good pipes that fella. The way he croons is golden. So there I was just minding my own business, like enjoyin’ the music, when I hear a sob. The smoke had already cleared so I could get a better look at the dame sittin’ beside me. She was a classy broad. You can always tell when the paint on the lips matches the fingernails. She was the kinda dame who’d look good on the arm of a fella like me, I thought, so I took the chance while I had it. If you want to read the rest of the story, CLICK HERE to order your copy of the December issue. Geraldine Mac Donald is a graduate of Queen's University, a former registered nurse, a medical/scientific translator; a writer, published author, and mother of four. One favourite memory of childhood was when she discovered that town libraries were public and anyone could get a card! It was a life-changing day. Her first novel for young adults has recently been released to rave reviews. Her second novel will be released in 2016. Besides translating medical stuff she writes fiction and creative non-fiction. Geraldine lives, works, and plays with her family in Kingston, Ontario. Are you interested in entering one of our contests? Just click HERE and learn what we're running right now! Happy Second Issue Release Day!